The Faraglioni rocks, the famous Blue Grotto (La Grotta Azzurra), dozens of other grottos, the spectacular lighthouse, intriguing inlets, dramatic promontories, transparent blue-green waters below, awe-inspiring cliffs towering overhead…these are just some of the wonders you will see on a trip round the island as Capri’s exceptional coastline gradually reveals itself along the way. There is so much to do at sea: swim, snorkel, sunbathe, explore… We will tailor any excursion to suit your preferences. Capri Boats Tours & Transfers can also help you enjoy other wonderful places around the Bay of Naples and the Bay of Salerno. An excursion to Positano, perhaps? Or maybe a cruise along the Amalfi coast? These are just some of the places waiting to be enjoyed on a day out. Choose a boat to match your mood. Explore the island at the leisurely pace of a gozzo, as used by local fishermen, enjoy the nippy speed of a RIB’s outboard motor or luxuriate in the elegance of one of our power cruisers as you cross the bay to a more distant destination. All our boats carry complementary water, wine, soft drinks and snacks. Apart from our rental services, exclusive private transfer services are also available, 24 hours a day, between Capri and any port in the Bay of Naples and the Bay of Salerno, including Naples, Ischia, Sorrento, Positano, Amalfi, Salerno, Sardinia and the Aeolian Islands. We know that planning what to do in an unfamiliar setting can be difficult. 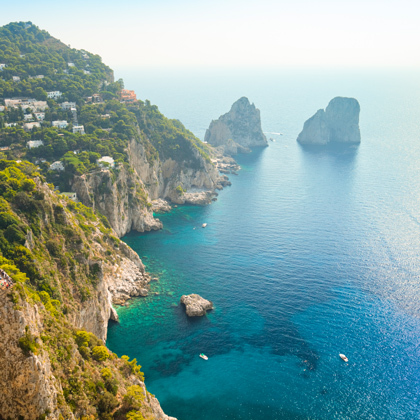 Use our local knowledge to make sure you have a wonderful time on Capri with Capri Boats. Tell us what you would like and we will provide. Your leisure is our pleasure! Get in touch by phone or email to make your Capri holiday experience easy, affordable and as much fun as possible. You will have the time of your life with CAPRI BOATS Tours & Transfers. I want to thank you for your service and hospitality for our trip to Capri. You were fantastic and the whole process went as smooth as it couldhave. We had a great time and look forward to coming back some day. Iwill tell all of my friends about you and your company.